Discussion in 'JS Plugin Releases (RMMV)' started by mjshi, May 19, 2016. @silversmithfara The "add" command is only greyed out if the length of the chosen runes is greater than the actor's rune limit, or if the actor doesn't exist. The second one shouldn't be happening, so it must be the first. Did you double-check your max rune limit? 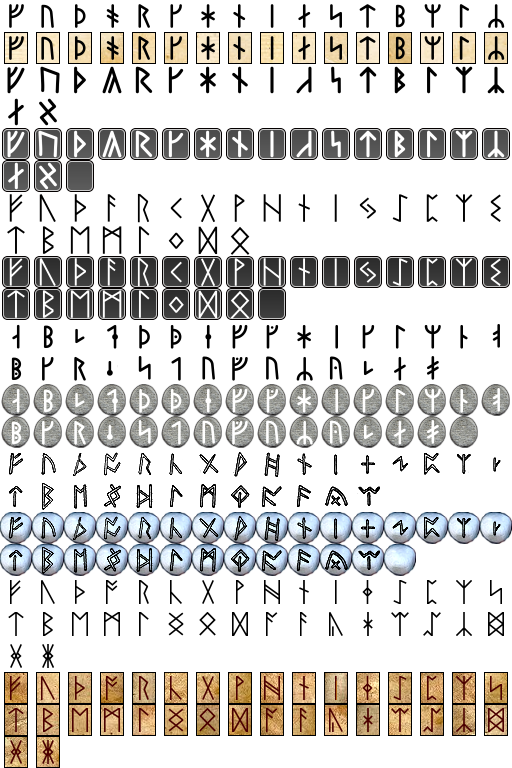 Does anyone have an iconset with a bunch of runes? I know the default iconsheet has the element icons, but I was wondering if anyone had something special with runes from the futhark or something like that. @ShellFlare You could make them yourself! The designs look pretty simple. but those spells look really nice! Crediting me (tale) is optional. Feel free to make edits where you see fit. While dusting off some of my old projects I decided to slightly change the way some things are handled for this plugin, to hopefully improve it. Quality-of-life and visual improvements. Also clarified some stuff in the help file. Plus, you can now learn skills after you cast them through runes, so you don't have to keep entering the same runes so much. The default screen now looks like this, which, in my opinion, looks much better. There's also less menu clickthrough, since that "add/cast" etc window doesn't disappear after *every* action. @chobokid Do you mean like a different background for each window, or just one static image that shows up in the background when the rune skills window does? I tried to keep the appearance similar to the skill window, so as not to clash with it in default projects. @chobokid Resizing images more complex than a single color or pattern generally does not work out well. Do you mean like using a different window skin for the rune skill windows? Havnt tested just as yet but looking forward too! (Pc got corrupt and I lost all my data so starting from scratch). One question. Is it possible to learn skills from runes ONLY for that battle? Because I like the constant use of runes, but I can see it getting annoying. it would be nice to learn the skills after rune cast, but then the rune system wouldn't get touched after a while and itll just be a skill craft system. I'd like it if you could use the runes, then use the skills menu to access combos you have already done for that battle only. @chobokid Soo is that a single image? Like I said, if you have a single image and just resize it for each window that isn't going to work very well. I'd recommend having a single background image instead or something, but idk if that's what you're asking. Added skill forgetting after battle. You'll need to tag the skills with the notetag <remove after battle> This works with all skills, not just rune ones. Really loved this one. I'm interested to use in my project as well, but i'm finding some difficulties right now. I don't use the common "level system", in fact i did use the Neo Crystal Engine - Final Fantasy II Progression System. I wonder if there's a chance of scaling the min-max runes with some stats like strength, agility, luck, etc. Btw, i'm using YEP - Equip Battle Skills - is it compatible? Thanks a lot for this awesome plugin! It should theoretically be compatible with Yanfly's Equip Battle Skills if what you're equipping are runes. I'll have to look into scaling runes with stats-- there's also a big update I'm planning soon for this plugin. I'll definitely add that into the feature queue! Currently done for the next version: Multiple rune combinations for a single skill, and having an option to make the runes required to cast a skill not be order-dependent. Planned: your scaling rune thing, and a window that shows the resulting skill (if the skill is known). edit For Yanfly's Equip Battle Skills you might have to designate "skills" to be runes and the resulting skills as something else. I'm not entirely sure without some further investigation, but that's a place to start! @mjshi Could the next update include where to move status icon on menu screen? @tale What do you mean, status icon on menu screen? Like the out of battle states? I was planning on doing that, but as an inclusion to my Pretty Sleek Gauges plugin rather than this one. Since it's more applicable there. By "next update" I meant the next update for this plugin, specifically.